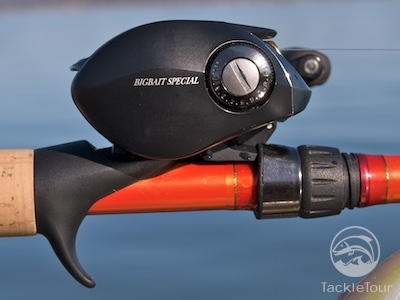 Introduction: The quest for that perfect big bait reel is a never ending journey especially if you're one that prefers left hand retrieve reels. 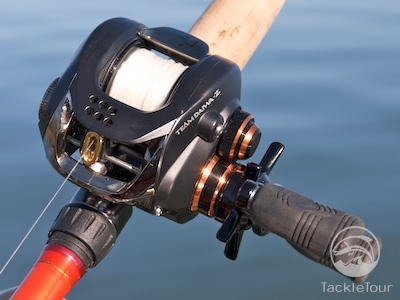 The standard reply by most big bait veterans is the Shimano Calcutta 300TE, but this reel is not available in left hand retrieve and I personally find the 400 a big cumbersome. Naturally, there is the Daiwa Luna 253 which but for many, this series of reels lack the refinement of the Calcutta. For low profile aficionados, the Curado 300 series from Shimano is the ticket, yet, lately for me, I'm finding the reel just a little too wide. Several years ago, prior to the introduction of the Zillion, back when the TDZ was still Daiwa's Flagship low profile baitcaster, Daiwa introduced their TDZ Big Bait Special. 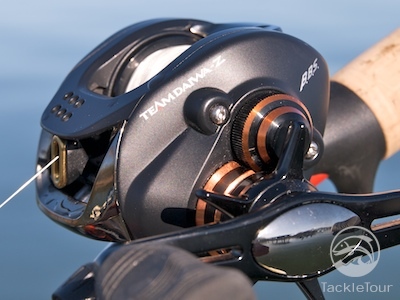 This was essentially a beefed up, aluminum version of their TDZ 100M, a popular cranking reel back in the day, and is still in production over in Japan. Curiously enough, given the popularity of big baits here in the States, Daiwa has never officially adopted this reel for the US market hence it's received little to no attention even by yours truly here on TackleTour. At its initial introduction, this reel was very hard to come by, but in recent years, it is becoming more and more common. So why the delay and why is it this reel has flown under the radar for so long? 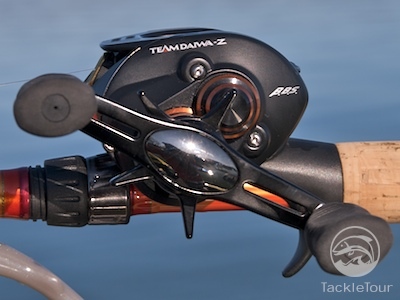 Presenting our in depth look into Daiwa Japan's TDZ Big Bait Special. Impressions: I admit, I've actually had this reel for quite some time. In fact, I've gone through three of them. I bought my first TDZ Big Bait Special (BBS) several years ago back when I was more heavily involved in the JDM reel market. For a year, it sat unused in my collection of reels before I decided to sell it to a good friend. For whatever reason, the reel never inspired me enough to make the final cut onto my boat as I prepped for each trip. To this day, I cannot explain why. I bought my second BBS under the guise that I really should use the reel and review it for TackleTour, but again, it sat unused in my collection of reels. To help with my inspiration of wanting to use the reel, I sent it off to ZPI of Japan to have it painted pearl white - maybe it was the color that threw me. When it came back, I slapped a 90mm I'ZE swept handle on it along with some cork knobs and I was ready to rock and roll. On the first cast with that superTTuned BBS, back it went into my locker - even its performance was uninspiring. I used it off and on over the course of the next year but never really got into the detail of why the reel wasn't performing. There was just too much other product to go through and review and the BBS just was not cutting it during the Swimbait Rod Wars. 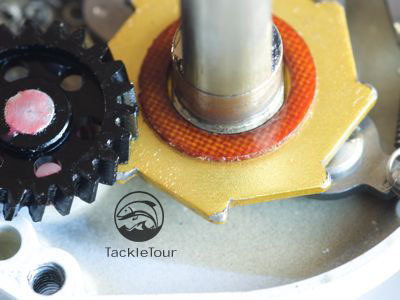 Enter 2009 and the Year of the Crank here on TackleTour and again, the subject of this reel has returned. Perhaps it'd make a nice cranking reel. So, off to purchase my third BBS for a clean review specimen and here we are today. Maybe the third time is the charm... or is it? So with the proliferation of big baits here in the States, why no US Version? The Lab: First stop for the BBS? well, actually first stop for my old BBS was the workbench in our lab. At some point in time, the reel was having trouble re-engaging after a cast, so I took it apart to check out what was going on. While I had it apart, I thought I'd take the opportunity to compare it to another reel that shares a similar profile, and in my mind, is essentially the same reel - the Daiwa Zillion. Take a look at the internals of the Zillion (left) versus the BBS (right). Note the BBS pictured is Cal's ZPI custom painted version from early 2008. In fact, the two reels are so similar in look and feel, and throw in the fact their spools are interchangeable, I'm certain the BBS, together with the JDM version of Daiwa's TDX reels served as inspiration for the TD Zillion series. Note the size difference between the gears, and as a bi-product, the drag as well. Again, the Zillion is on the left, and the BBS's gear is on the right. 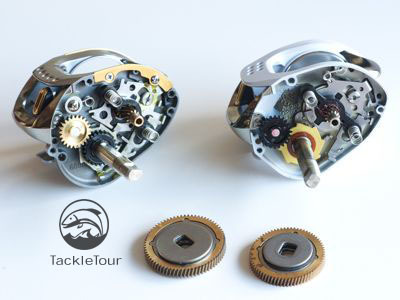 Well, as you can see from these photographs, the primary difference between these two reels lies in the size of their gearing (with the TD Zillion having a much larger gear) and the material that is used for the pinion gears. In fact, does the pinion on the BBS look familiar to you? Looks like the same one, or at least the same material that was used on the highly touted Deps ZDV to me. As Backlash, on TackleTog, would say, nothing is new. I should also note, however, the BBS does have a slight deeper spool - by about two millimeters. That's a little over one sixteenth (1/16th) of an inch. 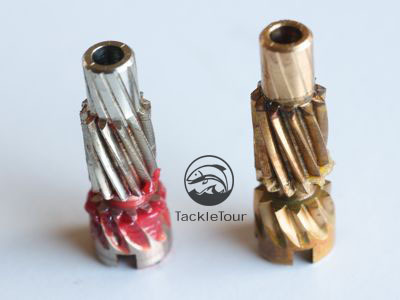 The pinion gears are of different materials. The BBS's pinion (left) looks to be the same as that of the Limited Edition Deps ZDV. So, in summary, what we've discovered so far, is the BBS is very similar to the Zillion with notable exceptions being the size of the gearing (with the BBS giving you less torque and surface area for the drag), line capacity, and the material of the pinion gear (the BBS's being the more durable). 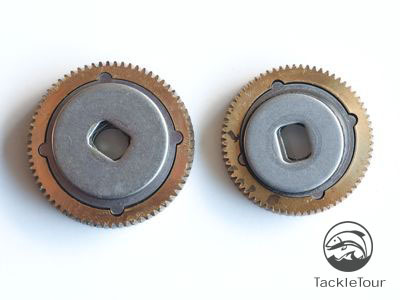 Other notable differences are in the reel's handle knobs. The BBS shares the same type of knobs found on the US domestic Zillions - black knobs with grooves for added grip with the exception that the knobs on the BBS are screwed in so replacement of the knobs and bearings (one per knob) is easy, but both reels share the long, 90mm cranking handle. The BBS has not held up to limited longterm use. Note the teeth on the reengagement clutch. They are worn and this piece is in need of replacement.